Ten years ago, world leaders convened in Johannesburg to establish the eight Millennium Development Goals (MDGs), global strategies designed to end poverty, hunger, and disease by 2015. While the pledges were ambitious, they neglected to recognize a critical component of sustainable development: transportation. Development banks, governments, and other decision-makers spent the next decade focusing their attention on MDG priorities. Meanwhile, cities around the world faced worsening traffic congestion, increased air pollution, and dangerous roads. We’re now face-to-face with the next major global development summit, the U.N.’s Rio+20 Conference. One of the biggest tasks at hand will be shaping new “Sustainable Development Goals,” plans that will pick up where the MDGs left off. This time, we can’t leave transportation out of the agenda. Climate Change: Transportation is responsible for one-third of all greenhouse gas emissions in developed nations and is the fastest-growing source of GHG emissions in developing countries. Traffic Fatalities: More than 1.2 million people die from road deaths every year, with that number expected to double by 2030. A root of this trend is found in the growing number of cars and amount of vehicle travel, exposing drivers, pedestrians, and bicyclists to deadly crashes or life-changing injuries. Physical inactivity: Nearly 3.2 million global deaths occur each year due to illnesses linked to a lack of physical activity, such as diabetes and cardiovascular disease. Yet motorization and urban development geared towards cars is taking walking and biking out of daily life, leading to more inactive and obese people across the world. Air Pollution: Urban outdoor air pollution contributes to about 1.3 million premature deaths globally every year. If automobile use increases—a plausible scenario considering world population projections—so would these fatalities. Congestion: Time lost as a result of traffic congestion reduces city residents’ opportunities and productivity. Population growth and increased automobile use would only exacerbate this situation. India, for example, is expected to have more than 650 million vehicles on the road by mid-century—a figure equivalent to the number of automobiles in the world today. Poverty: Cities built for cars rather than public transit can deepen economic inequities. Take one neighborhood in Istanbul: Its nearly one million car-less residents have virtually no access to the rest of the city. 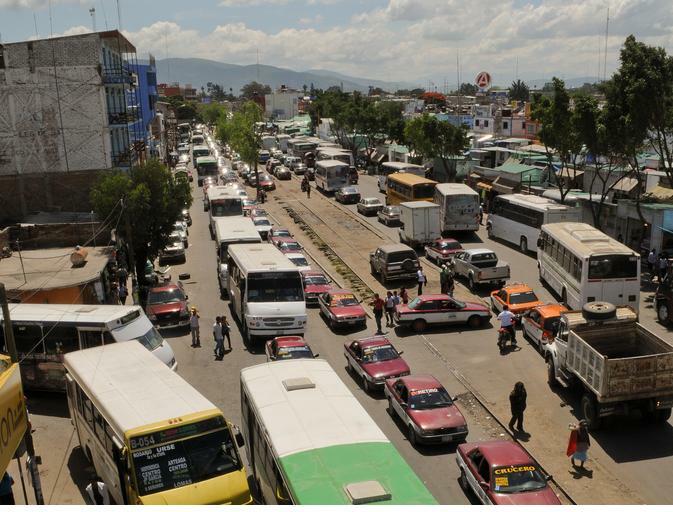 A freeway separates these people from other communities, and a public bus only offers six trips per day, with the last returning before the typical work day ends. Therefore, access for all people to goods and services is vital. Brazil: A new bus rapid transit (BRT) corridor in Rio de Janeiro expects to serve more than 200,000 residents, providing them with a safe transportation option and, in many cases, cutting commuting times in half. India: Cities like Rajkot are researching solutions to reform the auto-rickshaw sector. This important form of transport helps feed into public transit and improve mobility, posing less of a threat to pedestrians than heavier cars. Mexico: Cities are modifying urban codes to foster walking and biking, safe urban design, and vibrant public space, with demonstrative projects like a 40,000-person low-income housing development in Aguascalientes and a guide on transit-oriented development. Turkey: Cities like Sakarya and Antalya are working to recapture the bicycle as a mode of transport, allowing for residents to be more active and safe. As the global population expands—recent projections show that the planet will hold 9.8 billion people by 2040—we need to make sure that the resulting development doesn’t come at the cost of our environment, our health, and city dwellers’ quality of life. Sustainable transportation not only makes streets safer, cleaner, and less congested, it makes residents happier, healthier, and more productive. But discussions are only one step in the process. We need to start talking, but more than that, we must follow through on our word by including transportation in the Sustainable Development Goals.